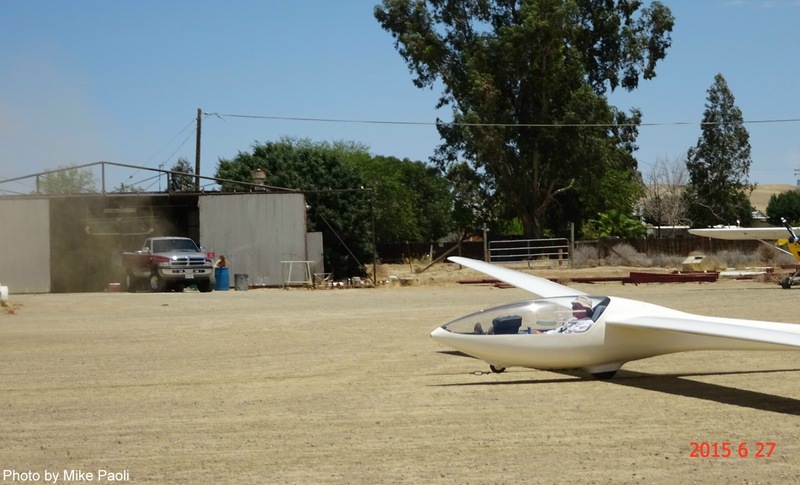 Central California Soaring Association: Saturday, June 27, 2015. Wind: Variable from all directions, especially from the northwest and gusty. Altitudes: Not sure since few reports came in but over 4500 msl. Time Aloft: Again, no reports except an estimate of 2 plus hours. Temperature: 108 deg F on the patio in the shade. Comment: Hot, dry, dusty, thermals all over the field in all directions. Tow pilot: Thanks to Julie Butler. Morgan Hall, Mike Paoli, Jeff Richardson, and Peter Sahlberg were on the runway clearing the goat-head plants to avoid those nasty stickers that look like tiny land mines. 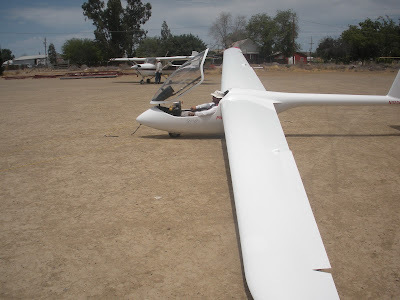 And they stick to the soles of your shoes, and try their best to puncture the tires on sailplanes. Trudging in from the effort, all the guys looked tired and hot, not unexpectedly. But the job got done, thanks to them. 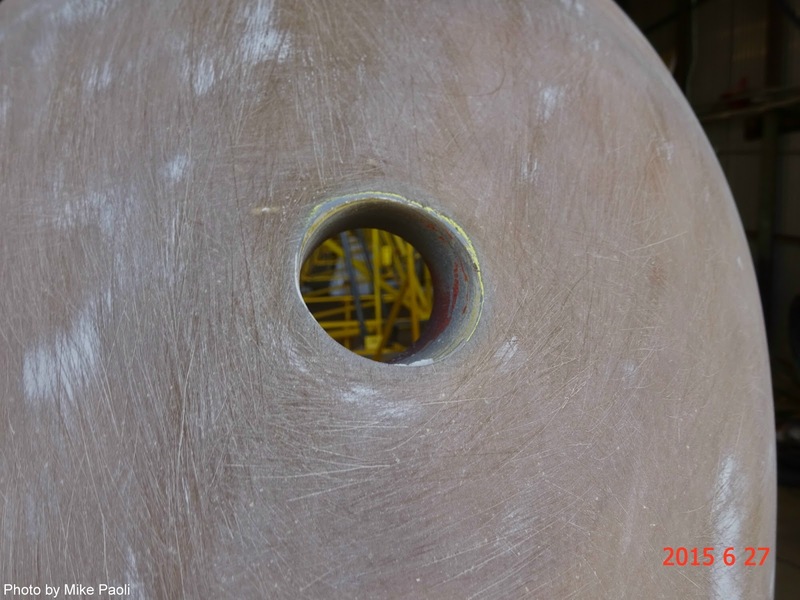 There were a fair number of members out today doing various jobs including continuing work on Big Bird. Jim Rickey, Martin Caskey, Jan Zanutto, et. al., were the effort crew. Nose cone on the Big Bird fuselage, the last big addition before the fabric goes on. Air duct on the nose cone of Big Bird. 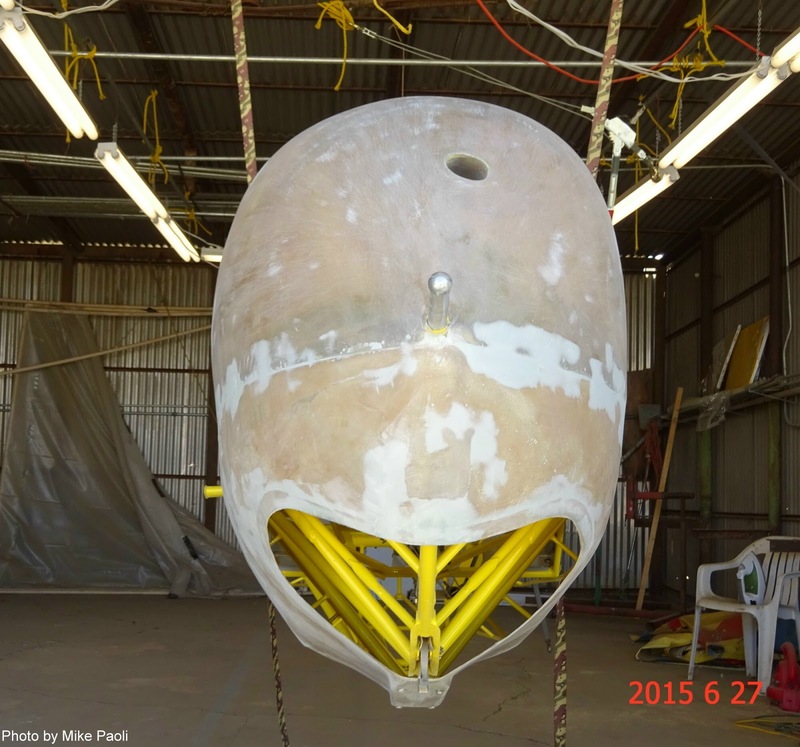 It will soon fly once again, hopefully in time for summer thermals. 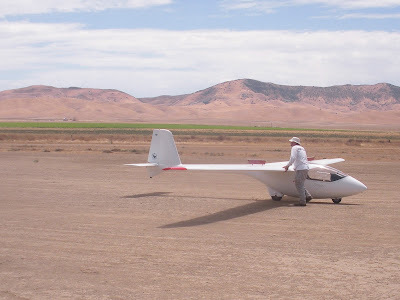 Andrew Ouellet came down from the Bay Area to fly his beautiful sailplane and attempted to fly along I-5, heading southeast then joining the ridge to get all the way to New Cuyama. Not sure if he made it since he lingered around the airfield longer than I think he expected. Maybe we'll get a report from him in the next day or two. Julie Butler landing after a warm-up flight in the tow plane. Jeff Richardson decided the day was right for a checkout in Julie's DG100 since it is now a club ship and available for rent at a very reasonable rate. 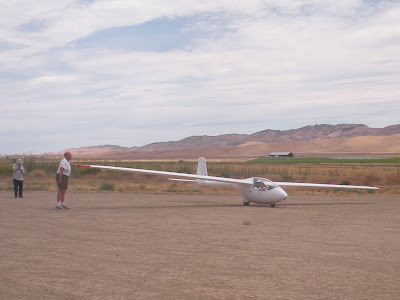 Julie checked him out in the controls, procedures, and handling characteristics of the glider, and finally, with a gusty crosswind, he launched. 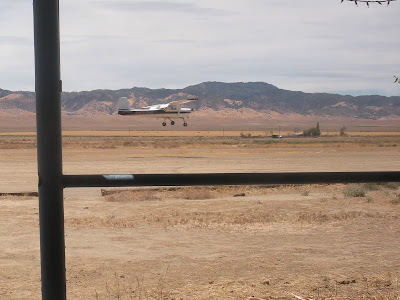 Did very well, with no PIO on takeoff. 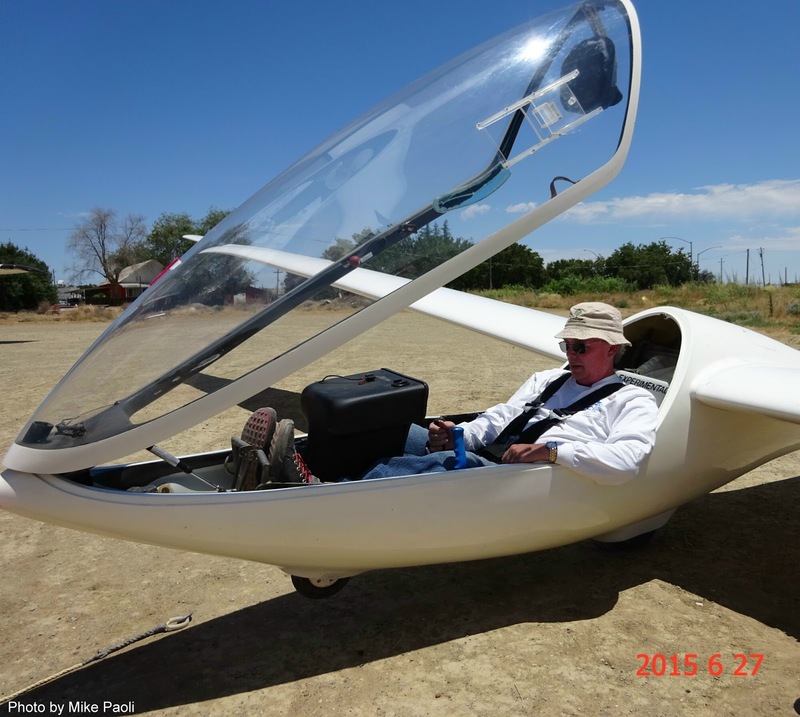 And he was up a long time so he must have enjoyed the flight and the handling of the glider. Julie and Jeff checking the pins, readying them for the wing additions. 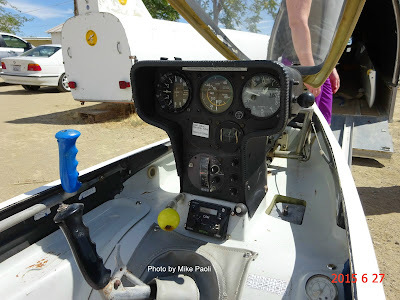 Nice instrument panel set up for those planning to get checked out in the DG100. 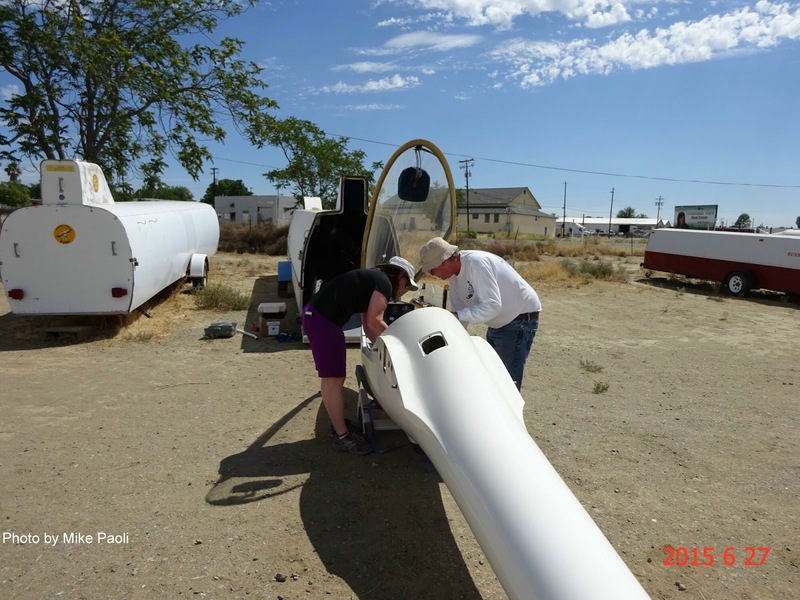 The wings now come out of the trailer to be added to the fuselage carefully. 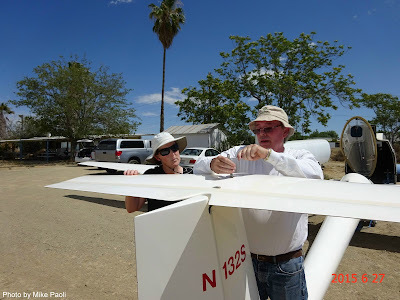 Julie Butler supervising Jeff Richardson while he assembles her DG100. 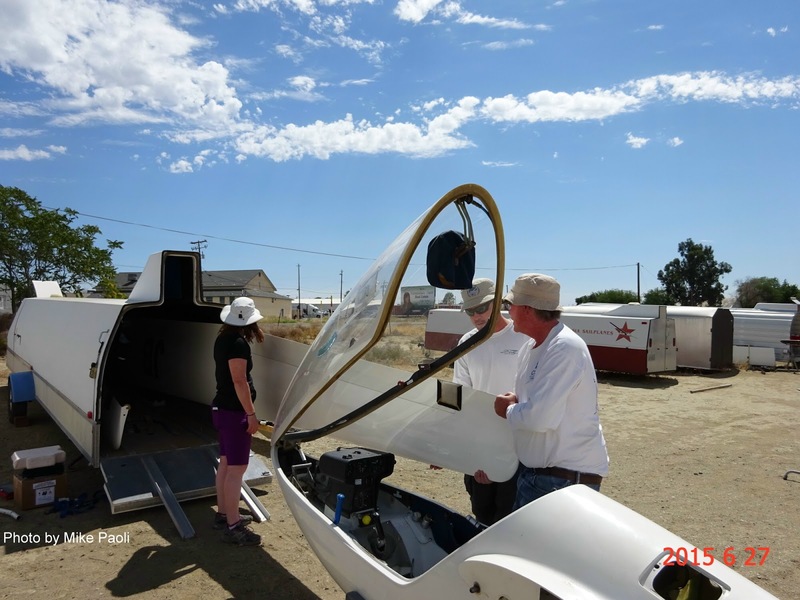 A few last minute words of advice from Morgan Hall and Jeff will be ready for his first flight in the DG100. 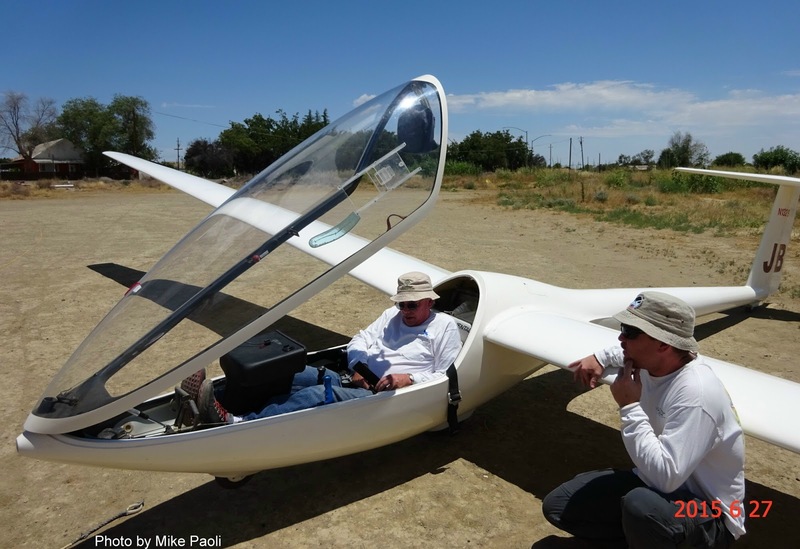 Pre-takeoff reflective thoughts about the controls, instruments, and expected handling characteristics. 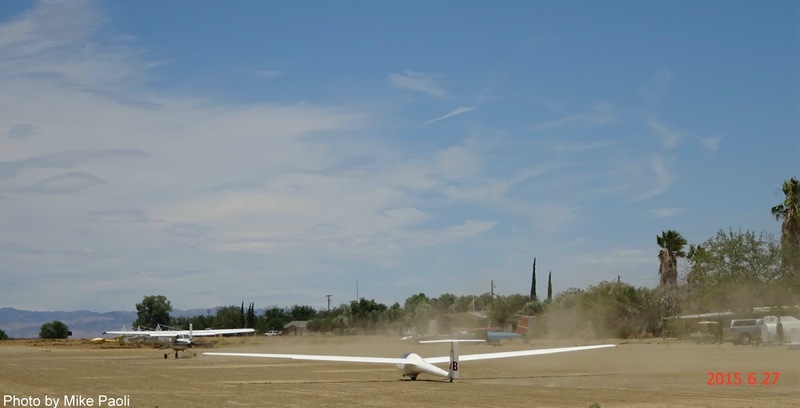 Good start on the launch, wings level even in a good, gusty crosswind. 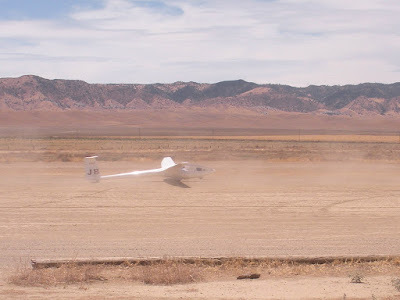 Out of the dust and holding the attitude steady, Jeff had no PIO's on takeoff. 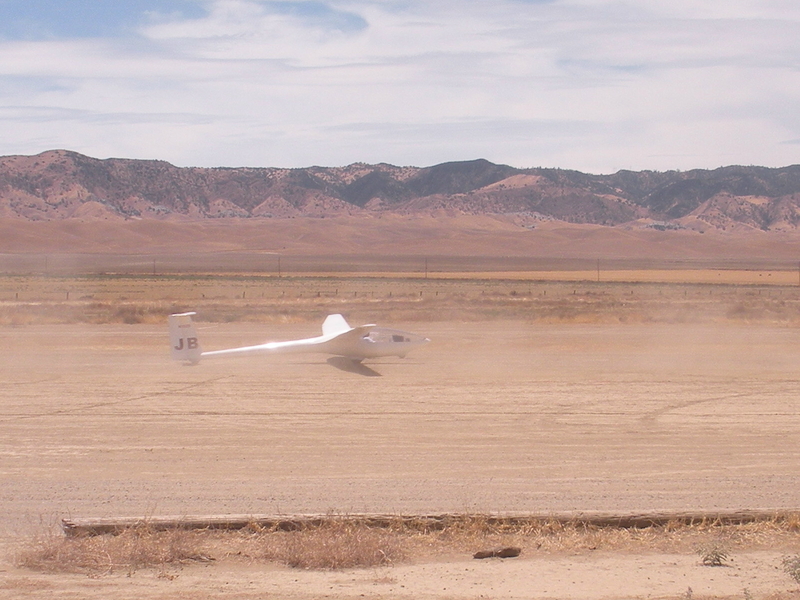 Jeff Richardson launching in Julie's DG100, a first flight in it for him. 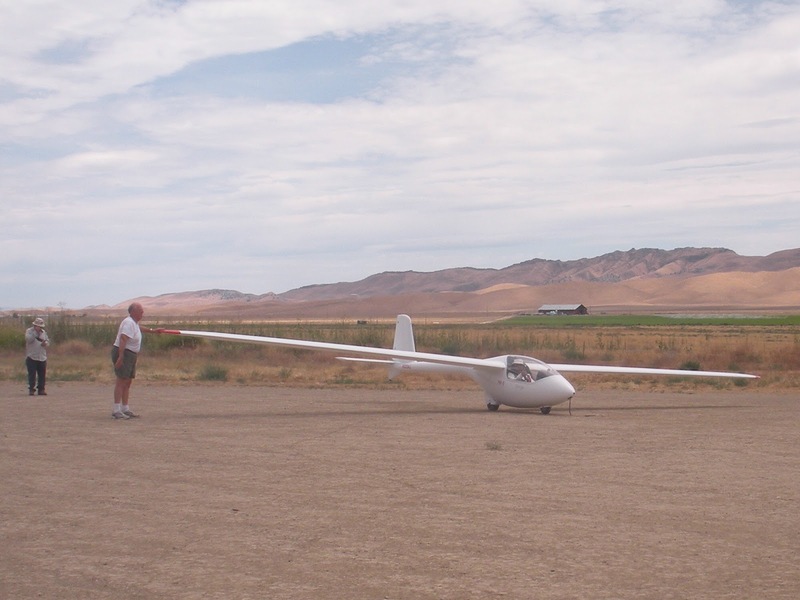 Joe Anastasio, after working around the field, and having Martin Caskey do the annual on his glider, he launched in the PW-5. I wasn't around when he landed so he must have had a good flight. 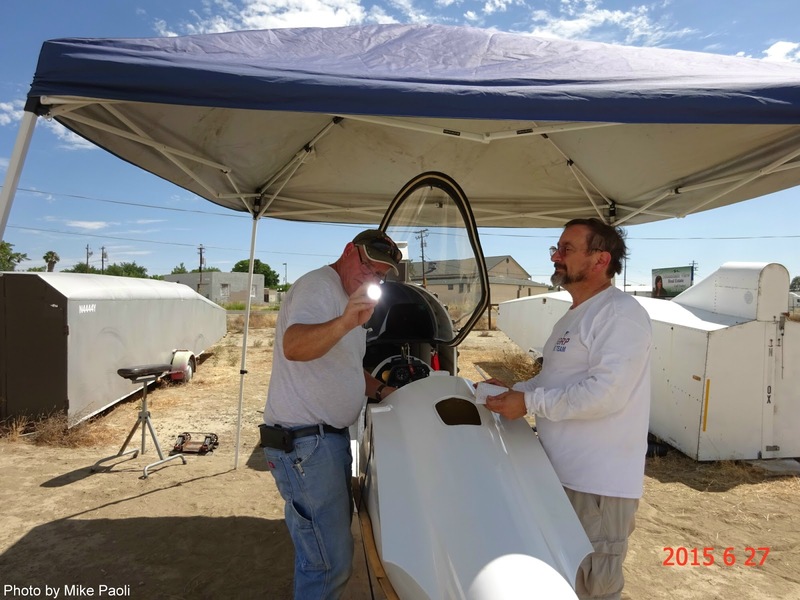 Martin Caskey hard at work doing the annual inspection on Joe's PW-5. Joe Anastasio pushing out his PW-5 in preparation for flight. Joe waiting in the PW-5 while Julie chats with Mike Paoli. Now Joe is ready, Jim Rickey runs the wing, and Mike Paoli waits in the background. 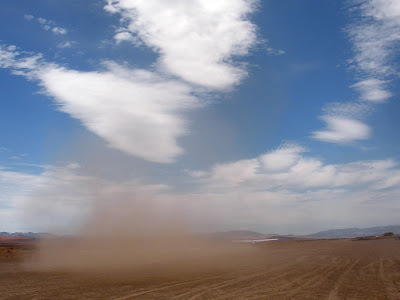 A cloud of dust marked the day, dry and hot, with gusty winds, and big thermals. Among all this activity, Peter Sahlberg decided to find out why the swamp cooler wasn't working. Including a pump that wasn't operating, and a tray full of mud preventing water from entering the pump, he worked for more than an hour cleaning the tray, and disassembling the pump for cleaning. Now it all works again and we have cool air streaming through the clubhouse. Thanks, Peter. Tyler Bishop waited an hour or so for the gusty crosswinds to subside, then launched in the 1-26. He had a few minor PIO's on takeoff but nothing dangerous. After not a long time aloft, he landed with a rather hefty bounce, saying he got into some deep sink somewhere on the runway as he was a few feet off the ground. 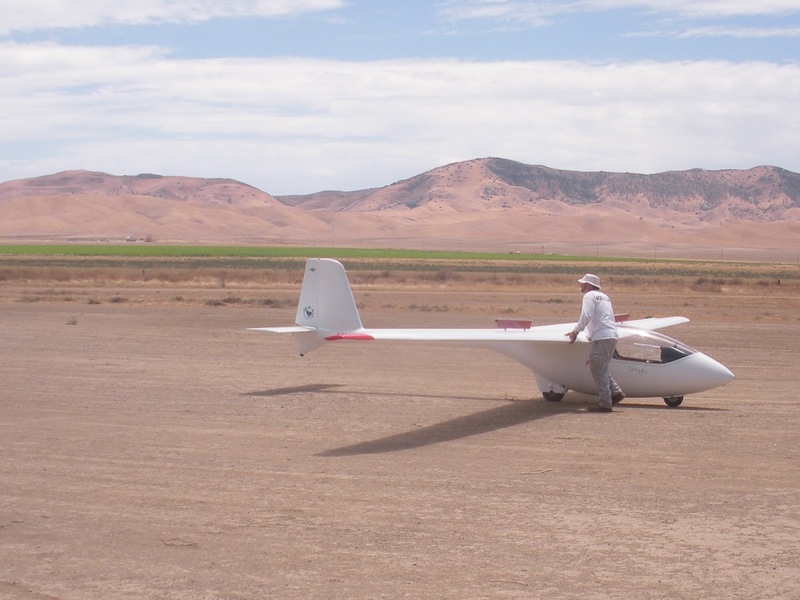 Tyler about to launch in the 1-26 while Harold runs the wing. Later on, Tyler and his Dad, Hugh, really helped me out of trouble with my car all the way back to Fresno, including a run they made for water as I limped to a stop on some deserted place along Rte 41 about 20 miles south of downtown Fresno. And that was the second time they stopped and helped. I would have been stranded for hours had it not been for them. So thanks guys for sticking with me all the way home. I had a good flight in the 1-26. Julie gave me a great tow into strong lift along Hwy 33. I climbed to over 7,000 ft. in the area between the highway and the Kettlemen Hills. Lift seemed particularly strong over the Burrito Place. 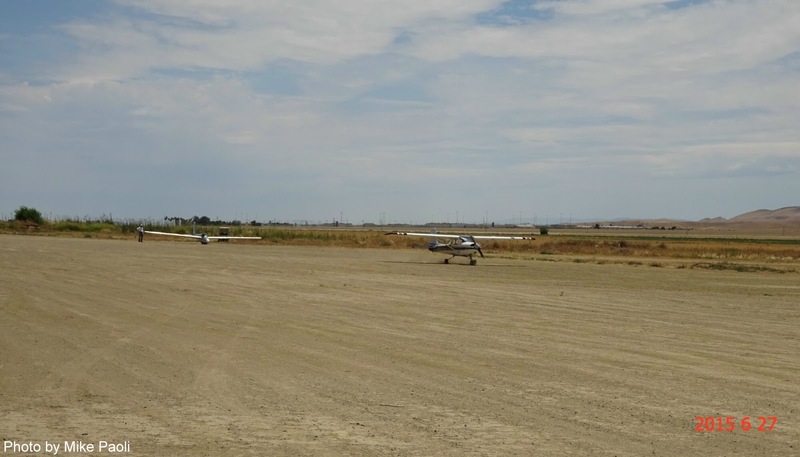 My landing demonstrated the need to practice x-wind landings at every opportunity. Jeff, Joe, and Andrew all had good, long flights. 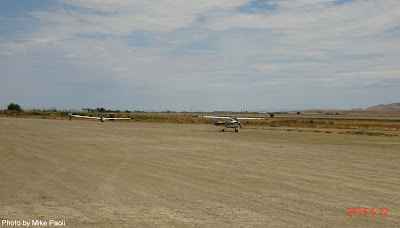 I think Andrew topped out at over 10,000 ft. and Jeff at 8,400 ft. Jeff was very impressive flying the DG-100 for the first time, with a smooth takeoff and landing in not so smooth cross-wind conditions. After a nice flight Jeff landed and got help putting the DG100 back in its box at the end of the day. Tucked away nicely in its box, the DG100 gave Jeff a very good ride. 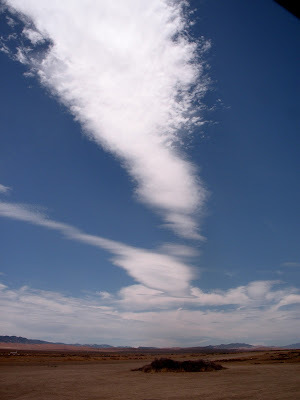 Looking northwest towards Coalinga, lenticulars formed from a mountain range far to the northwest. 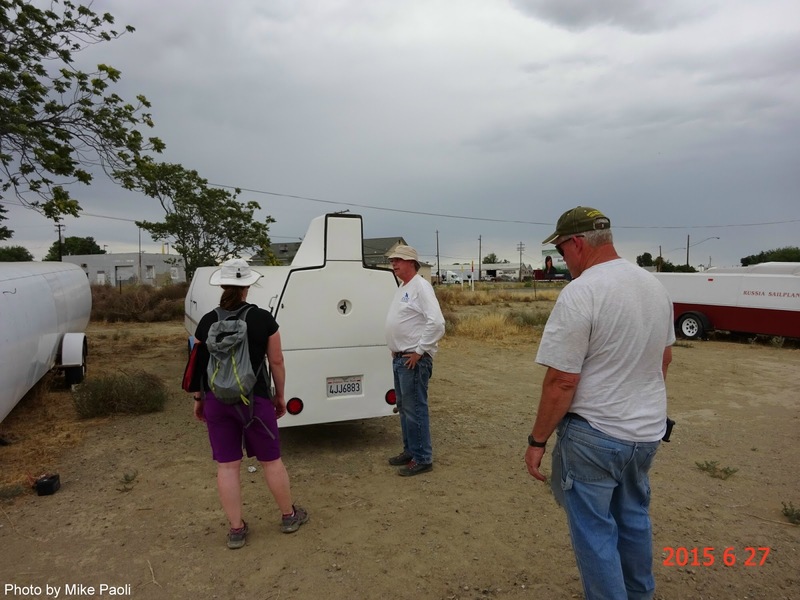 Not too much else happened today, considering the temperature of 108 deg F. Most of us were moving slowly, staying in the shade, and drinking liquids often. Maybe next weekend will be a bit cooler but we can't count on that. And of course, next Saturday is July 4th, so the celebrations may override the temptation to go soaring. We'll see then.